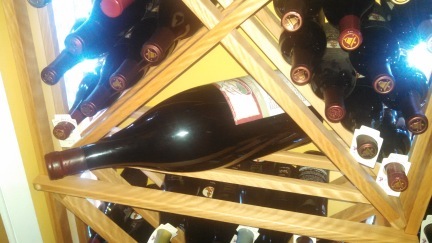 What Are Large Format Wine Bottles & How Much Do They Hold? 56 Glasses of Wine. Why Not? This Is a Salmanazar Next to a Standard Bottle of Wine. 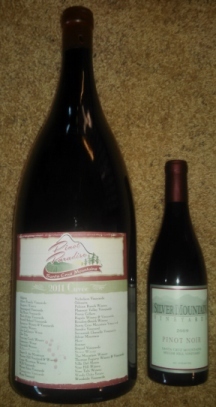 What are the largest wine bottles? They run the gamut from three standard bottles of wine, up to ones seemingly big enough to fill an average sized swimming pool. By the way, if you’re looking for information on the more standard format wine bottles, please visit part one of this post, which covers single serving bottles through Magnums. So why make large format wine bottles anyway? Is it a plot by Doctors to expand their hernia repair business? Perhaps the teetotalers of the world think that if wine comes in bottles that are too heavy to lift, people will stop drinking (like that is really gonna stop us). In reality, high quality wines that are capable of aging, age more gracefully in large format bottles because there is very little air in the bottle, relative to the amount of wine. The less air, the less oxidation and the better the aging process. Of course putting wines that aren’t designed to be aged in large bottles is an utter waste of time. Wines without the character to age won’t age well no matter what size bottle they are in. Well made wines from Bordeaux and Burgundy can benefit from this treatment. Large format bottles from Champagne are pretty much just for show. The first size larger than a magnum, the Marie – Jeanne consists of 3 standard wine bottles or 2.25 liters. It’s only found with Bordeaux style wine bottle shapes. The Double Magnum not surprisingly, holds the same amount of wine as two Magnums, (come on, I hope you figured that one out from the name) or four standard wine bottles. The double Magnum is the name in Bordeaux. In Burgundy and Champagne, it’s called a Jeroboam which is about to start getting very confusing (trust me, you’ll see why in a minute). These both hold 3 liters of wine. The next size up holds 6 liters of wine or 8 standard bottles. Now this has the makings of a damn good start to a party! In Bordeaux it’s called an Imperiale and in Burgundy and Champagne, it’s called a Methuselah. In the bible, Methuselah was said to have lived for 969 years but I don’t suggest trying to age any wine that long, no matter what size bottle contains it. Things at least start to get a little easier after the 6 liter bottle of wine because Bordeaux doesn’t make a wine bottle larger than an Imperiale. Those damn folks from Burgundy and Champage continue to mess with us by having still larger bottles though. The nine liter or 12 bottle format is called a Salmanazar, presumably named after one of five different kings of the Asserian Empire of the same name. What they have to do with Burgundian wine is beyond me though. Next up, the Balthazar which holds 12 liters or 16 standard bottles of wine. Balthazar of course, was one of the three wise men or Magi, said to have followed a star to witness the birth of Jesus, although I have to question the wisdom of putting wine in a bottle that is so heavy you need a forklift to pour it. Last but not least, of the sizes that are actually produced, is the Nebuchadnezzar, named after the Persian King who built the fabled Hanging Gardens of Babylon for his home sick wife…random historical fact by the way. They didn’t hang people in the gardens. The plants were rumored to look like they hung from the air due to the height of the gardens. This monstrosity holds 15 liters of wine or 20 standard bottles. It’s so damn big, that when it’s empty, you can probably turn it into a hot tub. There are two other larger format wine bottles but to the best of anyone’s knowledge, much like the Loch Ness Monster, Sasquatch or an honest politician, they’ve never actually been seen. They are the 18 liter, 24 bottle Melchior, and the 25.5 liter, 34 Bottle Sovereign. Is it just me or does it seem ridiculous to make a wine bottle that is big enough hold a third world country? Who the hell comes up with this stuff anyway? One more thing about large format wine bottles by the way. They seriously screw with wine storage so plan carefully before you buy or you may find that you quickly run out of space as you can see from one of our wine racks.